Beatcircle are extremely proud to hype up our music loving public even more with D-Sarb’s next release. It is with the same DJ who has surpassed a million views on youtube, Dj Dips! Last month, D-Sarb shot straight into the no.1 spot with ‘Charkey’, his first ever Official Asian Download numero uno. 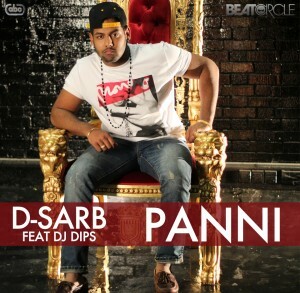 However, instead of stopping right there, he went straight back into the studio and nailed yet another massive track with DJ Dips, entitled ‘Panni’. A song reflecting the male swagger when contested by the girl of his dreams but….he must play it cool and let her know what he is about. This entry was posted in Bhangra Urban, D-Sarb, Home Page and tagged BeatCircle, D-Boy, D-Sarb, DJ Dips, moviebox, panni, playbacktv, thebeatcielce. Bookmark the permalink.